On Saturday, February 6th at La Esquina, just after Jessica Borusky and Judith G. Levy’s cross-dialogue on Persona and Place, visitors wandered about the gallery while technicians and members of the U.S. Department of Arts and Culture (USDAC) prepared for the facilitated discussion about to take place. A group of chairs were positioned in a circle, and two tables were set up with name tags for everyone who had been invited to participate . There were snacks, pens, and markers, so it promised to be an enjoyable time. Dave Loewenstein and Sara Taliaferro explained that they would be the core facilitators for this event, and asked the “official guests” to introduce themselves. Jose Faus, artist, writer and teacher. Dave and the USDAC emailed out materials to read before the discussion, including a description of the dialogue and an essay written by Roberto Bedoya, the Executive Director of the Tucson Pima Arts Council and a USDAC National Cabinet member. Collaborators split up into two groups, and Dave Loewenstein and Sara Taliaferro facilitated discussions about Roberto Bedoya’s essay and posed some initial questions. Bedoya’s essay was asking an audience of community-engaged artists and organizers to analyze Creative Placemaking Projects from the perspective of whether they center belonging. He argues that projects that fail to perceive this aspect as essential to cultural and social navigation end up doing harm to the communities they seek to improve. Dave and Sara led their collaborators through several different imaginary scenarios, and the premise of the first conversation was to share a story where you encountered something difficult culturally or socially, and then describe how you went about navigating that. There was to be no cross-dialogue at this point, so judgement would not shut down a simple, shared experience. Then , Sara and Dave pulled out a hat containing slips of paper, so each person could randomly select a persona to assume for a discussion about community development projects. Identities ranged in age, role and ethnicity (from a 13-year-old schoolboy to a single mother, a senior, a city official or a developer), and the collaborators assumed these positions for a conversation – while a silent audience watched. The intricacies of these simultaneous dialogues were challenging to capture. Yet the thing that stands out the most to me now is how amorphous, dexterous, and fluid the atmosphere became as the different voices of these intelligent and passionate people intermixed, questioned, and persuaded one another to see the different angles to complex social needs, assets and relationships. While the light slanted through the windows and engulfed Dave’s group, the cast shadow of the exhibition wall claimed Sara’s table within its dim, warm hues. For me, the manifestation of time’s passing – as the shrinking light of day was overtaken by growing shadows – invoked a sense of the endless necessity for community endeavor and initiative (and created a constant need to adjust the exposure time on my camera :•)). Participants were also asked to draw out their ideal community, and center collaboration and negotiation in the decision making process by attempting to include all the different community roles that had been assigned. Finally, the groups rejoined into one and the barrier of silence was broken for the inactive audience members. The irony of the exclusion of the audience from the discussion up to now, was that it mimicked in many ways how many voices can be left out of dialogues about how their community will change. 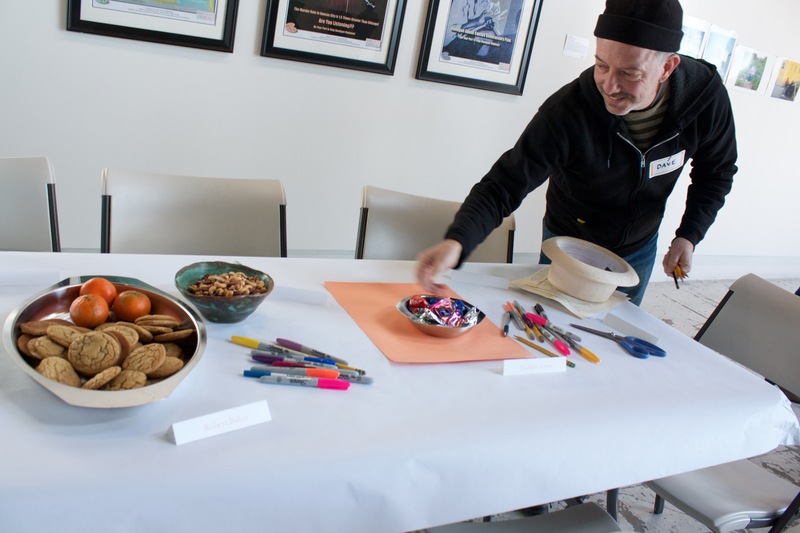 Together, we reflected on our perceptions of the larger framework of this workshop, as well as the necessities, oversights and dead ends within community art endeavors that seek to center equity, belonging, and empowerment. We questioned whether our passions and our labors are actually well placed. Yet we also found points of commonality in seeking authentic relationships, and an understanding that to make art is to love, and being able to express love is essential to life. Art is the bridge, so it matters how we build it. Follow this link for a document that records the processes and collected comments from the conversation: Placekeeping Notes & Reflections.